An air separator is designed to release gases from system water upon heating or pressure drop. We supply the air separator to suit the demands of customers who experience issues with air in their heating and chilled systems to ensure that they function efficiently. If dirt isn’t removed from the system, it’s likely to reduce the system efficiency . When excess air and dirt isn’t cleared it can cause a noise, increase the pressure drop, resulting in blockages and system corrosion. In the long-run, an air separator that isn’t well maintained will result in failure, meaning that you’ll have to pay for expensive repairs. What is an air and dirt separator? An air dirt separator is a unit that is specifically designed to remove dirt and air in a way that’s efficient. As well as this, the air dirt separator can maintain the quality and efficiency of water, making sure that water is distributed easily. In choosing an air and dirt separator from Flowmech, there’s no reason why you can’t benefit from products with prolonged service life. The systems that we supply are designed to be innovative and remove air and other particles from the water inside your heating system. Air and dirt separators are designed to be easy to install in to the pipework of heating or cooling systems. They are designed and developed in accordance with industry requirements, placing emphasis on reliability and cost-effectiveness. The main purpose of the air and dust separator is to prevent pump failure and corrosion in heating pipework systems. With an air dirt separator, the air within the system is forced out of the top and released through an air vent. The dirt that builds up inside the system remains at the bottom and can easily be removed during maintenance. How can you benefit from the air and dirt separator? 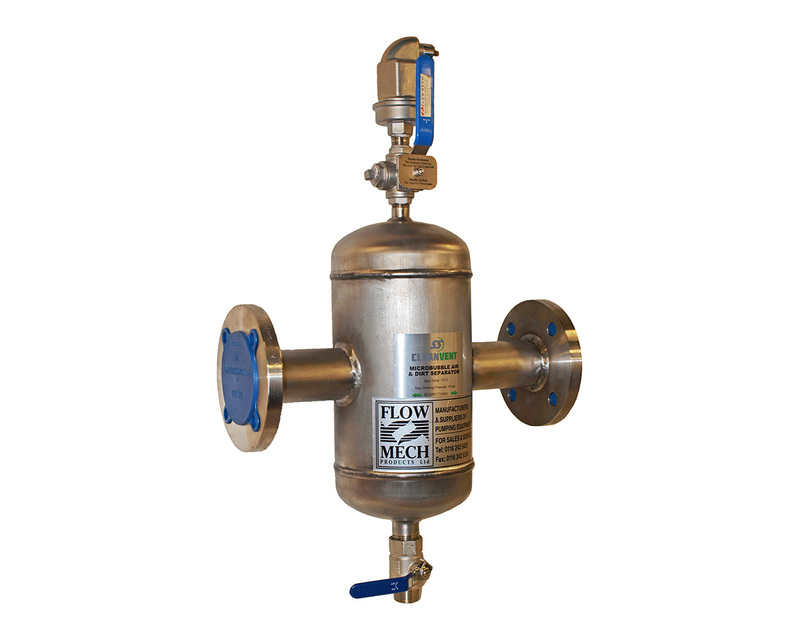 Here at Flowmech, we provide the air dust separators to suit every budget. We price our air and dirt separators affordably, ensuring that you receive the best value for your money. The air dirt separator provides low maintenance costs and reduces emissions. As well as this, the systems are designed to remove bubbles of air and dirt particles in one, making it more convenient. Any dirt particles are stored at the bottom and remain undisturbed, allowing you to drain them manually via the shut off valve. Our air separators are ideal for a wide range of applications but are commonly used in the building services and construction industry. They are often used for the heating and chilled water systems in high-rise office buildings to safeguard the boiler and pipework. The team here at Flowmech have gained a wealth of experience, supplying products to suit all industries and are always on hand to help. So, if you need to know more about air dirt separators, be sure to get in touch with us today on 0116 242 5425.